Geez, I never realized that I got the Christmas Day slot when it comes to our publishing schedule. Christmas Day AND New Year’s Day. So I guess I’ll need to talk about something that’s somewhat related to Christmas then. And maybe even a tie-in to Star Wars, which is getting so much hype due to the awesome but flawed The Force Awakens film (read Fiefo’s review for more details). Alright, back to Christmas. Whenever I think of Christmas, I think of toys. I seldom buy toys anymore because I’m already a grownup and I’m not into collecting toys or figurines but there have been exceptions like when a toy is really cheap (like Happy Meal toys from McDonald’s). However, I also purchase expensive toys/figurines if they could be used in some other way, beyond just being a display in a toy collection. Such is the case when I bought my first Amiibo: a figurine of Link, the main protagonist of Nintendo’s The Legend of Zelda franchise. Nintendo’s Amiibo are collectible figurines that can interact with video game software via NFC (Near Field Communication) chips. They’re similar with Skylanders, Disney Infinity, and these new LEGO Dimensions figurines, but with one big difference: the aforementioned three “toys-to-life” brands are dedicated exclusively to specific video game software each while Nintendo’s Amiibo could be used across multiple games. 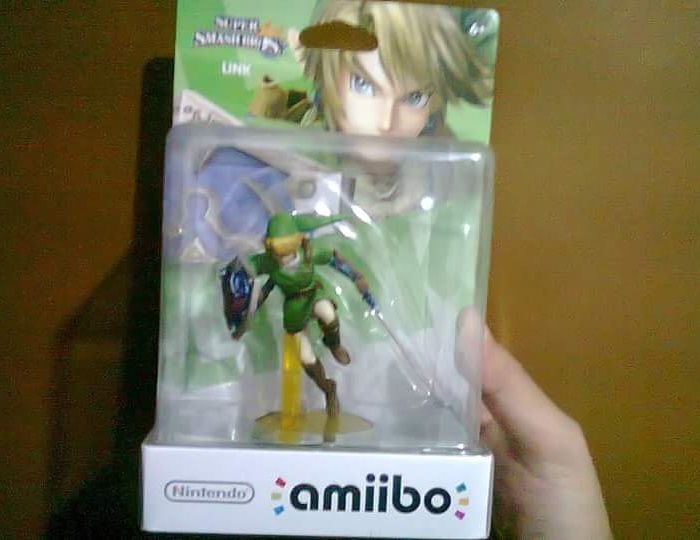 My Link Amiibo figure, which remains unopened to this day. Only a few Amiibo figures are compatible with multiple games. It’s already been a year since the first wave of Amiibo figures were released and so far, it’s been very disappointing. Only a few specific Amiibo figures are compatible with more than two games, and it’s worse if you only have either a Wii U or a New 3DS. I’ve only been able to use both Toon Link and Mega Man with Super Smash Bros. so far. Next year, there are two games set to be released that will be compatible with both my figures: Hyrule Warriors Legends with Toon Link, and Mega Man Legacy Collection with Mega Man. And I haven’t even talked about how these Amiibo actually function. In Super Smash Bros., both unlock the feature of having a special AI character that you can customize, train, and fight, with the Amiibo able to save your AI character’s data in case you want to bring it with you to a friend’s place and use it on his/her Wii U. In the titles that I mentioned above, both Toon Link and Mega Man can unlock either bonuses and/or game modes. Long story short, I haven’t had much use for my two Amiibo figurines and won’t have much use for them. I’ve barely used these two since purchasing them. I ended up buying two more Amiibo figurines, Zelda and Ganondorf, to complete my The Legend of Zelda “TriForce” collection. All three are still in their box, unopened. That’s pretty much what Amiibo figurines are right now, items to collect, and current Nintendo president Tatsumi Kimishima acknowledges this. In a recent interview with Time Magazine, he talked about how Amiibo are “being picked up more as a collection item” rather than “as an interactive item with software”, which is what Nintendo intended Amiibo to be. Now that I know better, I don’t think that’s a good idea. Let’s take a look at the other end of the spectrum, where we have the game Chibi-Robo! 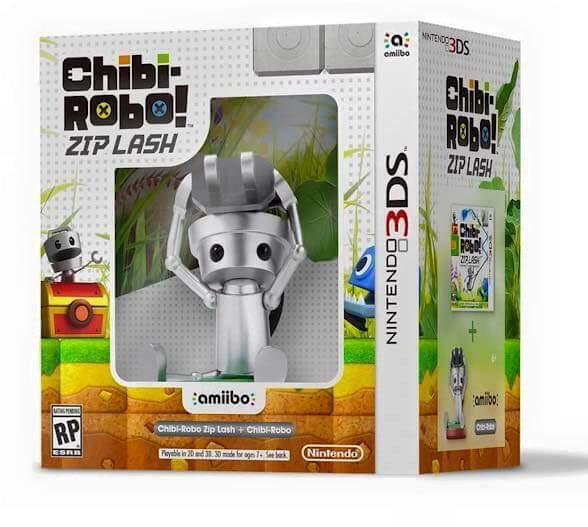 Zip Lash that is compatible with a Chibi-Robo Amiibo as well as the other Amiibos. Scanning other Amiibo would give you bonus coins and an in-game figurine of Chibi-Robo (as part of an in-game figurine collection) if you have access to the game’s “Capsule Machine”. How do you get access to the Capsule Machine? By scanning the Chibi-Robo Amiibo that’s only available through the Chibi-Robo game + Amiibo bundle. If you bought the game digitally, then you’ll have to hunt the Chibi-Robo Amiibo on the secondary market if you want the Capsule Machine. Why would you want access to the Capsule Machine? Aside from getting the in-game figurines, this is the only way to get the bonus World 7 levels of the game. The Chibi-Robo! Zip Lash game and Amiibo figurine bundle is the way to go if you want to get the full Chibi-Robo experience. That’s right. You can only play the World 7 levels of Chibi-Robo! Zip Lash IF you have the Chibi-Robo! Amiibo. And if you have the older 3DS model, you’ll also need to purchase the NFC Reader accessory in order to be able to scan the Chibi-Robo! Amiibo. Sure, you can beat the game without needing to play any of the World 7 levels, but you won’t be able to play the game in its entirety. Now picture a world where the next Super Mario game will have secret stages or game modes that can only be accessed if you own a specific Amiibo figurine. What about a Legend of Zelda game with a secret dungeon that you can only unlock through Amiibo? Or a new Pokemon game with super rare Pokemon that you can only obtain by getting that Pokemon’s Amiibo figurine? It’s almost similar to how some companies put content into their games but advertise these as DLC that you’ll have to pay for to access, only this time around you’re paying for an Amiibo figurine instead. I’m starting to prefer the Disney Infinity approach wherein you buy dedicated software that makes use of the different Disney Infinity figurines. I’m actually very thankful that the newer editions of Disney Infinity aren’t compatible with the Nintendo 3DS, because these editions feature intellectual properties that I’m quite fond of: Disney Infinity 2.0 focuses on the Marvel Universe and 3.0 is based on the Star Wars Universe. Heck, figurines of characters from The Force Awakens are already available in stores as of this writing. We already have Disney Infinity 3.0 figurines and a playset based on The Force Awakens available on the market. The problem with mirroring the Disney Infinity approach is precisely that; it’s merely copying the Disney Infinity approach. Is there a middle ground in all this, wherein we can have Nintendo software that is specifically dedicated for Amiibo use AND have stand alone video games that have bonus Amiibo unlockables? I honestly don’t know. That’s the problem that I’m seeing with Nintendo’s Amiibo; either they’re merely collectible items with minimal video game interaction, a method of locking additional features behind additional required payments, or a copy of the existing “toys-to-life” approach. I hope that Nintendo finds a way to make Amiibo truly innovative and not just a new way of printing money. How do you feel about Nintendo’s Amiibo? Let us know what you think by leaving a comment or two below!